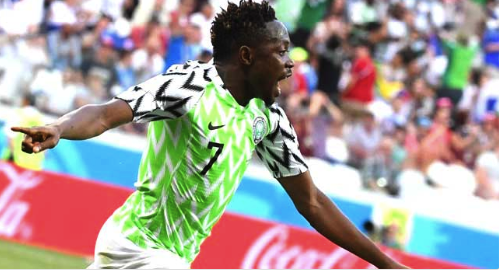 Ahmed Musa’s superb second-half brace secured Nigeria a priceless 2-0 victory over Iceland to keep their World Cup dreams alive. After a tight first half of few chances at Volgogread Arena, Musa controlled a Victor Moses cross with a fine first touch before blasting the ball high into the net four minutes after the restart. With Iceland stretched trying to get back into the game, Musa – after having just hit the crossbar – showed lightning pace to get in behind the defence and round goalkeeper Hannes Halldorsson before finishing into an empty net to seal the win. Iceland had a golden opportunity to get back into the game eight minutes from time after referee Matthew Conger awarded a penalty following a VAR review, but Gylfi Sigurdsson blazed the spot-kick over the bar. Iceland had their best chance in the last minute of the half after Gylfi Sigurdsson whipped a free-kick into the Nigeria penalty box, but none of his team-mates could stretch out enough to tap the ball into the net. The result also boosted Argentina’s hopes of reaching the last-16, with Lionel Messi’s side set to qualify for the last 16 if they beat Nigeria in the final game of the group. 0 Response to "Video: Nigeria 2 – 0 Iceland [2018 World Cup] Highlights"